This entry was posted on Thursday, May 22nd, 2008 at 10:47 pm	and is filed under Update. You can follow any responses to this entry through the RSS 2.0 feed. You can leave a response, or trackback from your own site. God bless you China! Today may 25th, 2008 at 16:30 I felt another shake was stronger than the last one, I am in Taiyuan and I was very scared. 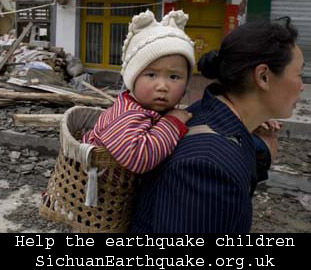 I hope anything is ok in Sichuan. I called some friends from Deyang and they told me they are fine. today may 27th 16:19 other little shake. I am in Taiyuan, today at 10:50am we felt other shake, was very short, maybe 30 seconds. I felt it because I am in the 12th floor, the people on the 1st floor didn’t feel anything. I think in Sichuan was strong, because is 1,500km from here.